Chinatown is a vibrant neighborhood running from H and I Streets to 5th and 8th Street in the northwest quadrant of Washington, DC. 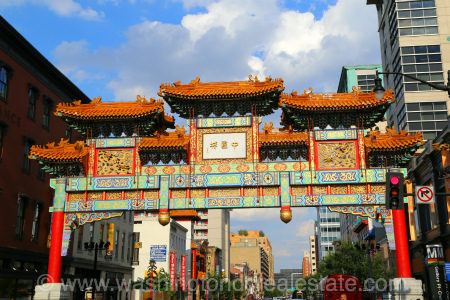 Now part of the bustling Penn Quarter neighborhood, the entrance to Chinatown is marked by the Friendship Arch, a Chinese gate built over H Street at 7th Street. Chinatown is home to approximately 20 Chinese and other Asian restaurants and small businesses, all of which spell out their names in Chinese characters as a requirement of doing business in there. Once upon a time, Chinatown was rundown and an area to be avoided after dark. This all changed in the late 90s when the Verizon Center, a sports and entertainment arena, opened, bringing with it a wealth of sophisticated restaurants and chic retail outlets. One of Chinatown’s best kept secrets is its residential component. Luxury condos and other upscale development discreetly sit atop Gallery Place as well as other restaurants and boutiques, providing the area with a true live, work, and play experience. Notable attractions near Chinatown include: The National Portrait Gallery, the Smithsonian American Art Museum, the International Spy Museum, and the Washington Convention Center. Chinatown is served by the Gallery Place-Chinatown Metro Stop.